Sellers often underestimate the role of emotions when they sell their home. Oftentimes, sellers are so focused on the overall price and time frame when they sell a West Knoxville home, they completely forget to address the role emotions play. Unfortunately, that can be a critical mistake when you sell a West Knoxville home. Emotions can change the way you price a home and your overall approach to the process. So, before you sell your home, it’s important to address your emotions and learn how to properly manage them during the process. In this post, we’ll discuss just that. Selling a West Knoxville home is hard. Period. It’s stressful and inconvenient. You’re dealing with showings and having to keep your house clean. And, you don’t know how long the process will go on. On top of all of that, you’re managing how you feel about selling your home. There are many times where sellers don’t even realize the role emotions are playing in selling their home. Sometimes, sellers will be grumpy and irritable about selling their home because they’re having a hard time managing how their feelings. Or, they’ll be irrational about pricing their home because their emotions make them feel like their home is worth more. Before you list your home, take the time to acknowledge that the process won’t be easy. The place has tons of memories and for whatever reason, you’re deciding to sell, it’s going to be sad to sell it. But, you need to take the emotions out of the process and focus on moving forward. It’s the only way you can successfully sell your home. But, you need to take the emotions out of the process and focus on moving forward. It’s the only way you can successfully sell your home. There are many reasons why sellers decide it’s time to sell their home. Your family may be growing, you may need to downsize, you may be relocating, or you may feel like the market is finally right so it’s time to sell. Regardless, there’s a reason why you’ve decided to move on. When you decide to sell your West Knoxville home, focus on moving forward. Focus on the new home you’ll be moving to. Focus on the new life you’ll be living moving forward. It’s really the best way to keep your emotions in check. When you know your reasons for selling are for good reason, it makes it easy to move on and take some of those emotions out of selling. A real estate transaction is a business transaction. There’s a contract, money involved, and a property changing hands at the end of the transaction. You have to hold up your end of the bargain and so does the buyer. It’s all business. As a seller, you need to treat it that way to keep it that way for your own sanity. When you finally decide to list your home, one of the biggest decisions you make will be pricing the home. This is where emotions can run rampant. Many sellers will not take into account the facts that are provided when a realtor makes a suggestion on price. This is one of the biggest mistakes sellers will make based on their emotions, ignoring the facts and making the decision based on pure emotions. Keep in mind, setting the price isn’t about emotions. It’s about getting the home to sell. As you go through negotiations, it’s also important to not take things personally. Sometimes when buyers request repairs or negotiate the price, sellers can take it personally. Once again, the buyer is just trying to get the best deal they can get, as with any business transaction. Just keep in mind it’s not an attack on you personally. 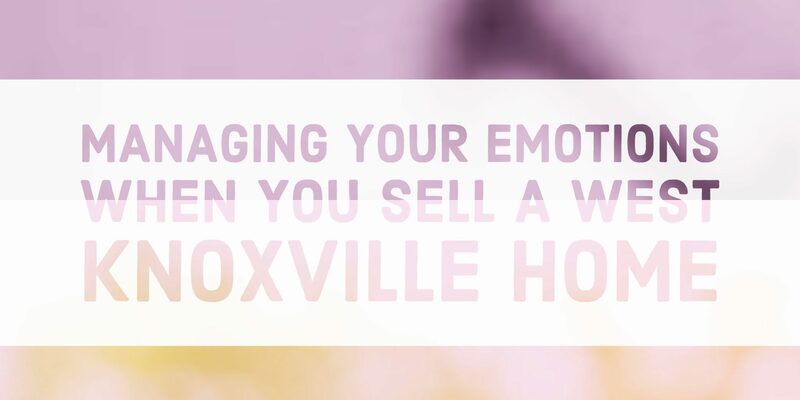 Finally, one way to help manage your emotions when you sell a West Knoxville home is to plan for the future. When you get to plan what you’re moving on to, it can help ease the emotions of selling your home. Once you’ve decided to sell your home, you’re going to need to come up with some kind of plan for when your house sells anyhow. When you’re having a hard time selling your home, it can feel better to start planning where you go next. If you’re planning on buying another house, start looking at some homes. If you’re going to live somewhere temporarily, start making those plans. When you have something to look forward to, it can be much easier to part with your current home. When you sell a home, there is nothing wrong with having some emotions. Just don’t let them ruin the process for you, it can be a mistake that you’ll come to regret later on. When your emotions cloud your judgment on your price, it can cost you a great deal of money in the long run. Are you thinking about selling your Knoxville home this year? Please let us know if there is any way that Knoxville Home Team can assist you. Rick can be reached at 865-696-9002 or via email at Rick@KnoxvilleHomeTeam.Com. Kati can be reached at Kati@KnoxvilleHomeTeam.Com.